It is believed that many people have heard of osteoporosis. 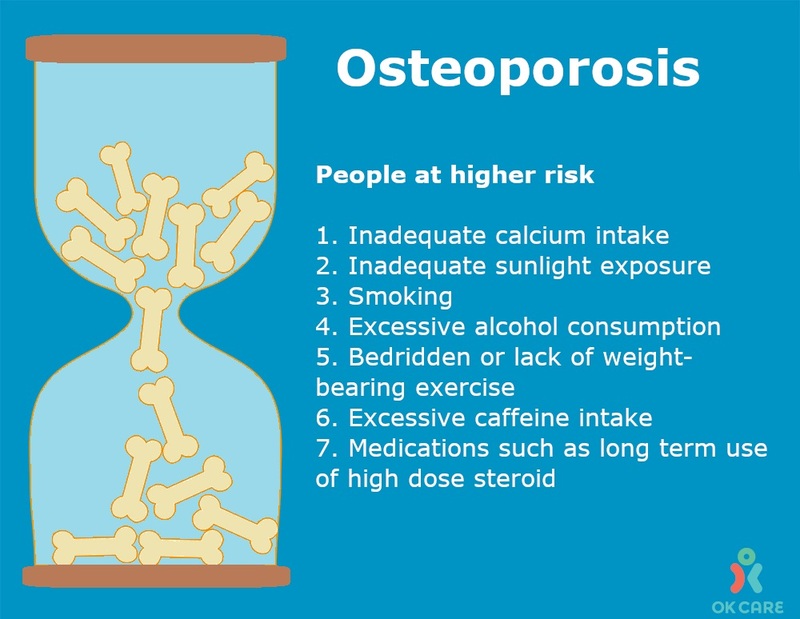 But do you really know what osteoporosis is? The bone density in our body increases with age, and peak at 20 to 30 years old, after that the bone density will slowly decrease. As bones become less dense, the bone will be hollow and loose. And this is osteoporosis. It usually has no symptoms, but it can cause bone fragility and is more prone to fractures. Adults over the age of 19 should consume 1,000 mg of calcium per day, while women over 50 and men over 70 should consume 1,200 mg of calcium per day. Milk and dairy products such as cheese and yogurt are rich in calcium. Each cup of milk contains about 260 mg of calcium. It is recommended to drink 1 to 2 cups per day. It is not recommended to have bone soup as main calcium intake as the calcium content actually is not high. Calcium-rich food include: canned sardines and salmon (with bone), dried fish, shrimp, clams, oyster etc. 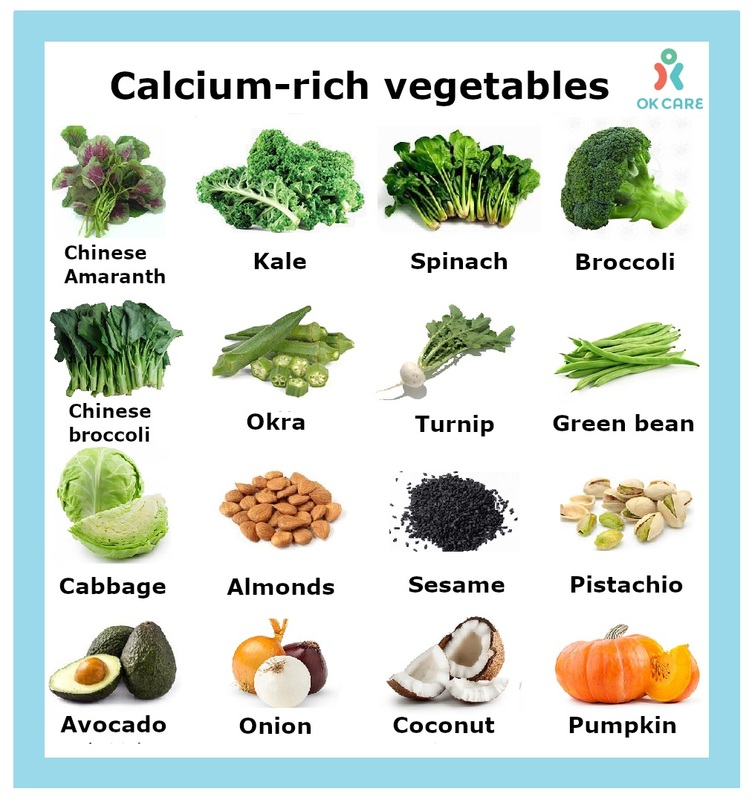 Calcium-rich vegetables include: soybeans, almonds, tofu, sesame, dark green vegetables such as broccoli, Okra (ladies' fingers) etc. Calcium is best taken from food. If you can't get enough calcium in your diet, you would consider taking calcium supplement. However, the volume might vary from person to person, please consult your family doctor before taking. In order to ensure that we can absorb calcium from food, outdoor exercise is a must. Exposure to sunlight can activate our skin to produce vitamin D which enhances calcium absorption. It is recommended to expose to sunshine at least 30 minutes per day. Weight-bearing exercises such as walking, running, climbing stairs, dancing, etc. can help maintain healthy bone. If you have injury in knee joint before, you should choose the low-impact exercise, such as walking. (The intensity and length of the exercise vary from person to person. If you feel unwell during or after the exercise, stop immediately and check with your doctor or physiotherapist as soon as possible). Good posture can also prevent and improve osteoporosis and reduce the pressure on the spine. 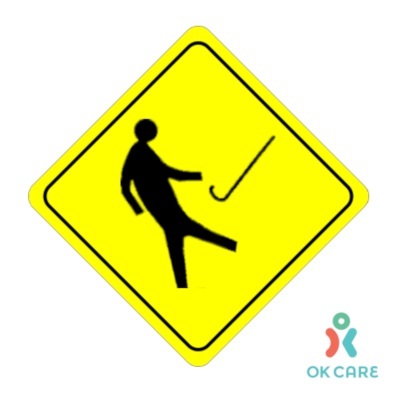 People diagnosed with osteoporosis must prevent falls in order to avoid fractures. In addition, exercise can improve the muscle strength and coordination, improve the home environment are means to prevent fall which might lead to fracture of osteoporotic bones. Bathrooms, toilets, stairs should be well lit, with anti-slip mats or handrails to reduce the chance of fall. Household environment and safety assessment or balance assessment are useful to identify potential risks. Quantitative Ultrasound (QUS): for screening purpose, not suitable for diagnosis. Dual Energy X-ray Absorptiometry (DEXA): for diagnosis and monitoring of treatment effect. Bone density examinations are available in many hospitals and clinics. For details, please check with your doctor. © OK Care Limited. All right reserved.